I am always involved in multiple projects that are in various stages of completion. When possible, I briefly discuss the conclusions of my work. However, many journals have strict rules about the dissemination of project results prior to publication. If you have any questions about my ongoing or published work, please contact me! Throughout an organism's life, it will face complex situations with varying levels of risk and the behaviors, mechanisms, and outcomes that occur during predator-prey interactions have significant fitness consequences. Risk-sensitive foraging behavior integrates behavioral plasticity with the need for acquiring energy. Furthermore, when facing hunger, organisms will forage on sub-optimal prey and take greater risks to acquire food. We (myself and an undergraduate collaborator) are using the theoretical framework of risk-sensitive foraging to make predictions about the behavioral modulation of functional morphology in snakes when facing reductions in prey encounters. 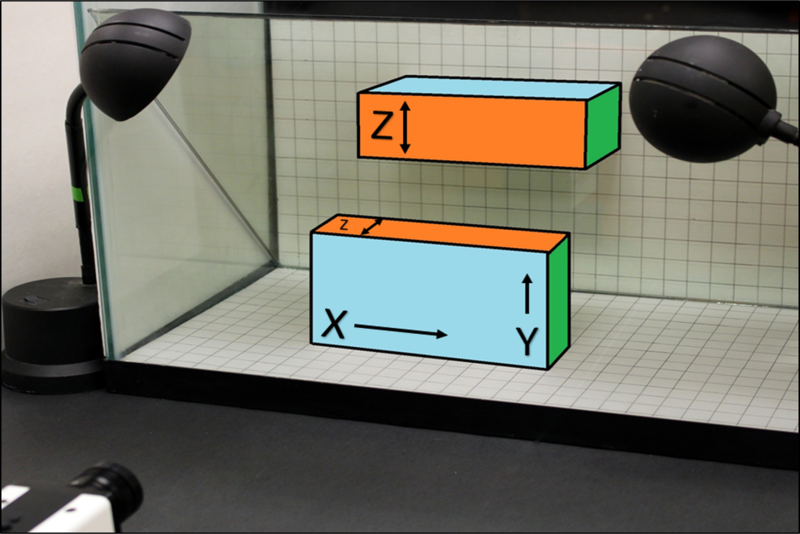 Previous work on constriction performance has shown that it is an energetically expensive behavior and snakes can modulate their performance in response to varying prey cues. Here, we test the effects of hunger (varying feeding frequencies) on predation performance. Do snakes increase their constriction performance when hungry, at the cost of excess energy loss, to secure a meal? Or do snakes conserve their already limited energy reserves when hungry and downregulate their constriction efforts to prevent further energy loss? Penning, D. A., & Self, Z. (in prep). Hungry for more: testing the effect of prey frequency on predation performance in snakes. Temperature plays a fundamental role in the lives of many animals and when body temperatures are low, performance is typically reduced. Reductions in performance are typically caused by reductions in the rate of force development in muscles. However, elastic recoil mechanisms can break the link between temperature and whole-body performance by decoupling the rate of muscle contraction from the energy release that drives movement. Elastic recoil mechanisms have been shown to be independent of temperature across a phylogenetically diverse range of organisms. Thermal independence of elastic recoil has been observed in insects, toads, salamanders, and lizards. Recently, based on muscle activation patterns, it has been proposed that snake striking is accomplished by an elastic recoil mechanism. If this is true, then based on what we observe in other elastic recoil systems, snake strike performance should be independent of temperature. However, the role of temperature on snake strike performance remains ambiguous. Using the western ratsnake, Pantherophis obsoletus, we (myself and two collaborators) quantified the effects of changes in body temperature on snake strike performance to test for the possibility of elastic recoil in striking. We tested 15 ratsnakes exposed to five temperature categories (15, 20, 25, 30, and 35°C) and recorded and digitized a total of 225 strike trials in order to quantify the effects of varying temperature on strike performance. Penning, D. A., Hillard, C.J., & Moon, B.R. (in prep). Quantitative effects of body temperature on snake strike performance: new insights into the elastic recoil hypothesis. Until now, my previous research on kingsnake and ratsnake predation has focused on whole-body performance and the linkage of performance to anatomy between these two intraguild competitors. To further explore the intricacies of predation performance in snakes, I tested individual muscle performance in kingsnakes (Lampropeltis holbrooki) and ratsnakes (Pantherophis obsoletus). Kingsnakes are notably more powerful constrictors compared to ratsnakes but I have yet to identify a mechanism that explains how kingsnakes produce significantly higher constriction pressures compared to ratsnakes. For this reason, I explored individual muscle function to test for physiological differences at the muscle level between these intraguild competitors. I quantified the isometric force and endurance of the semispinalis–spinalis complex and the longissimus dorsi to further explore and describe the abilities of constricting snakes. ​Penning, D. A., & Moon, B.R. (in prep). In Vivo Measurements of Force and Endurance from the Epaxial Muscles of Kingsnakes (Lampropeltis holbrooki) and Ratsnakes (Pantherophis obsoletus). ​Penning, D. A. (2018). Quantitative axial myology in two constricting snakes: Lampropeltis holbrooki and Pantherophis obsoletus. Journal of Anatomy 232: 1016-1024. 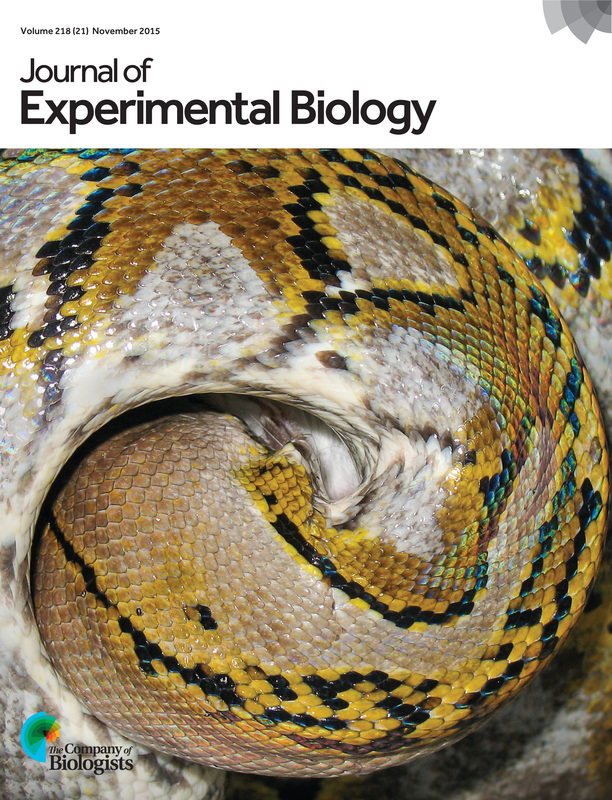 We made the cover of Biology Letters! Across the diversity of vertebrates, bite capacity has been studied and linked to important ecological and evolutionary consequences. However, there is a notable lineage of vertebrates missing from the bite force literature that relies heavily on this performance trait; the snakes. Many snakes rely heavily on biting to subjugate prey while a constriction coil is formed and others use it exclusively without employing additional prey-handling behaviors. 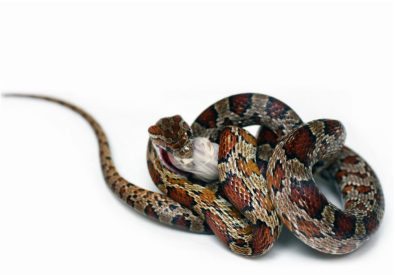 In addition to biting, constriction is an evolutionary and functionally important predation mechanism for many snakes. 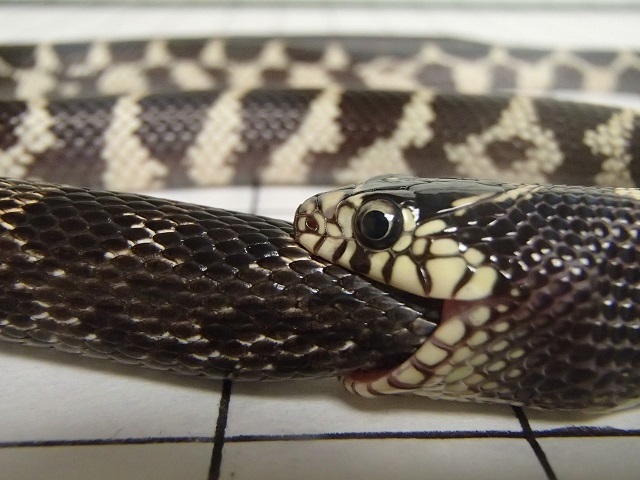 I quantified bite force capacity and constriction performance in kingsnakes (Lampropeltis getula). Furthermore, I explored the proximate determinates of bite force capacity and its relation to constriction performance to test for trade-offs between performance traits. Bite capacity increased linearly with all head and body measures. Of these, head height was the best predictor of bite force. Bite capacity in kingsnakes was within the range of values reported from lizards but their relative performance is greatly reduced considering the size disparity between the kingsnakes and the smaller lizards. Peak constriction pressure also increased with all body measures. Biting and constricting use two separate skeletal and muscle systems to accomplish one goal. Biting and constriction capacity are positively and significantly correlated with one another, suggesting that there is no functional trade-off between these two performance traits. Future work targeting a greater diversity of snakes that rely more heavily on biting may reveal a greater range of bite capacity in this diverse and successful vertebrate group. 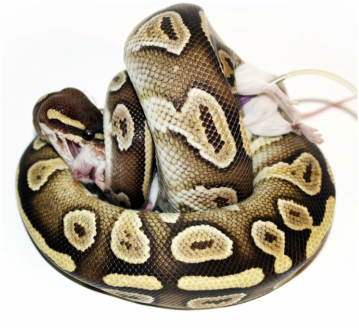 Very little work has examined the effects that different prey characteristics have on constriction performance despite many snakes incorporating different types and sizes of prey into their diets. Prey of different sizes have difference defenses and pose different benefits and risks to a snake predator. 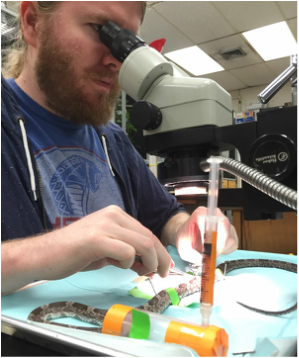 ​ Using Florida kingsnakes, I investigated the effects of prey size and type on constriction performance as well as the effect of repeated feedings. Currently, the target journal for this research has explicit rules about the publication of results before submission. Once this paper gets farther along, I will update this section! We are only beginning to understand the diversity of constriction performance. Kingsnakes (Genus: Lampropeltis) are infamous for their ability to consume other snakes and are even able to completely subdue and ingest snakes that are larger than themselves (bottom pic!). Kingsnakes force the spine of prey snakes into sinusoidal waves and their stomach stretches to accommodate the massive prey. You can see the spinal waves of the prey within the kingsnake (bottom pic). I am involved in many projects that investigate the linkage between form and function in limbless vertebrates. My dissertation work specifically investigates the mechanisms of intraguild predation between kingsnakes and other constricting snakes in order to understand how one constricting snake is able to defeat other constricting snakes (even when they are smaller than their prey!). I studied the ontogeny of muscle cross-sectional area, constriction performance, and defensive performance in six species of snakes across a wide range of body sizes (2 orders of magnitude in mass). To do this, I used the largest sample of snakes I could attain. I quantified muscle cross-sectional area in 38 snakes, the constriction performance of 182 snakes, and the defensive performance of 98 snakes. To my knowledge, this work is the first to link dietary differences to performance capacities in constricting snakes. ​​ Many organisms display allometric growth through ontogeny; shape and size changes relative to total body size. This differential growth leads to differential performance through ontogeny. Coupled with this change in growth are the notable difference in predation pressures for smaller individuals. Smaller animals are at greater risk of being eaten and many juveniles are capable of high levels of performance to partially offset their size disadvantage. For snakes, striking behavior can be used both to catch prey and ward off predators. 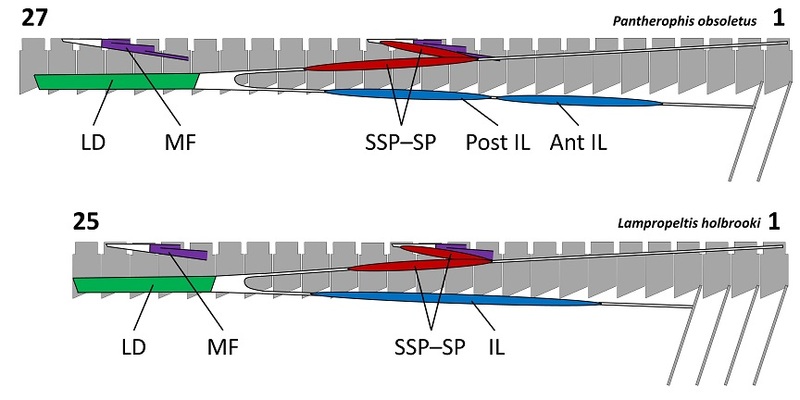 Despite these known patterns and processes, and the importance of striking behavior, very little work has evaluated the changes in defensive strike performance through ontogeny and its linkage to muscle morphology. With two great collaborators, we used high-speed video and imaging software to measure the scaling of head and axial morphology, and defensive strike performance, in western ratsnakes (Pantherophis obsoletus). We described the accelerations, velocities, distances, and durations of strikes from 59 snakes varying in size by two orders of magnitude. Relative head size decreased with body mass while muscle cross-sectional area increased. Therefore, larger snakes have relatively smaller heads and relatively more muscle to drive their movements. This differential growth across ontogeny leads to the prediction that larger snakes should be able to strike faster than smaller individuals. From our snakes, larger individuals struck over greater distances, but all snakes reached their target in a similar time (duration). Our kinematic analyses conformed to the morphological predictions; larger snakes struck with higher velocities and accelerations. There is much more to come from this project once we get through peer-review! Tortoises are incredibly popular in the pet industry. One of the more popular tortoises is the sulcata tortoise (Centrochelys sulcata); the largest continental tortoise alive (and 3rd largest overall). Sulcata tortoises can reach upwards of 200 lbs and can be quite charismatic. When they are born they fit in the palm of your hand, but give them a couple decades, and they may require more than one person to lift can and can overturn a brick wall. A unique problem persists in their captive care. Wild individuals have smooth shells; many captive individuals grow differently. In many captive tortoises, their individual scutes begin to raise as they grow. This phenomenon is called pyramiding and it can be quite severe. Environmental variables in captivity are causing completely different morphological patterns and calcium deposition in their body. This is an amazingly interesting and completely confounding growth phenomenon. I am currently working on a long-term project to understand what is causing the differences in growth between wild and captive tortoises and to specifically target a way to reverse or cease its persistence in captive individuals. Ball Python Constriction: Ontogeny and Experience My Master's work generated many new questions (as they usually do!). I knew that Colubrid snakes were behaviorally plastic compared to pythons. However, that doesn't preclude pythons from other advantages by having relatively fixed behaviors. With a collaborator, we investigated the impacts of size and experience on ball python (Python regius) constriction performance. In the first experiment, we allowed one group of recent hatchlings to feed regularly each week; we anesthetized a second group and manually fed them. The "normal" group gained constriction experience and expended energy to subdue their prey while the second group wasn't gaining experience or expending energy. At the end of ten weeks of trials we measured their constriction performance, and surprisingly, the snakes that had never constricted produced pressures just as high as the snakes with ten weeks of prior experience! Interestingly, the "normal" group of snakes was notably smaller at the end of the trials, suggesting a heavy energetic consequence to the behavior. In the second experiment, we detailed the ontogenetic scaling of constriction performance and found that only their diameter predicted their performance; larger snakes were stronger. All pythons, even after just hatching, produced pressures high enough to kill their prey. By always constricting their prey, pythons reduced their risk of injury and handling time. However, this behavioral rigidity may come at a great energetic costs. Behavioral plasticity and rigidity may represent different, yet equally successful, feeding strategies. We made the cover and the 2016 JEB Calendar! When I transitioned to my doctoral work I became increasingly interested in understanding the mechanisms of how snakes work. I also wanted to better understand how these mechanisms change through ontogeny; a hugely unexplored area of snake biology. With two great collaborators, we investigated how constriction pressure changes through ontogeny in two of the world's largest snakes (Python reticulatus and P. molurus bivitatus). These snakes generated impressive strengths and were able to quickly dispatch their prey. Our largest snakes (approaching 6 meters!) exerted incredible pressures that would be the equivalent of experiencing a large truck resting on your chest. Based on the pressures generated by these pythons, we proposed a new mechanism underlying the way constriction works-the Red-Out Effect. This phenomenon occurs in fighter pilots when they experience negative gravity. Blood rushes to their brain and eyes, they experience petechial hemorrhaging, and typically pass out. 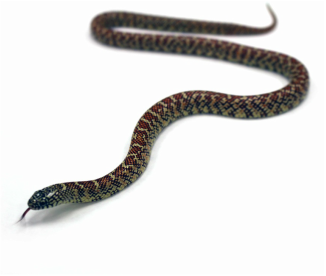 The pressures that pilots experience are similar to the pressures that snakes can generate on their prey. It is likely that snakes are causing multiple injuries to their prey but are likely incapacitating them faster than by suffocation and possibly circulatory arrest. John Murphy created a blog-post about our work! For my Master's thesis I focused on understanding how snakes use their predatory behaviors and how they change as they gain experience. I studied the changes in prey-handling behaviors in naive snakes exposed to either small prey or large prey over consecutive encounters. As snakes gained experience, they all began to use more complex behaviors to subdue their prey (constriction); some were even able to constrict on their first prey encounter. Snakes exposed to large prey switched to this method much faster than snakes that only encountered small prey. However, regardless of their past experiences, when prey reached a certain absolute size, all snakes switched to exclusively using constriction. Regardless of their past experience, all snakes employed complex prey-handling behaviors prior to the point at which the prey could vigorously defend themselves, suggesting an advantage to employing complex behaviors before they are necessary. Getting an accurate measurement of a snake's length can be remarkably difficult. I discovered this when coordinating several undergraduate projects; they all took measurements of the the same snake and they were all notably different! This is actually a pervasive problem in research on snakes (Madsen and Shine, 2001; Oikos) and even simple linear measurements can be highly variable between researchers (Palmeirim, 1998; Journal of Mammalogy). With the help of three undergraduate researchers, we each measured 59 snakes manually with a soft-tape measure and then digitally with measurement software (serpwidgets.com). We found that digital measures produced results as reliable as traditional measures and had several added benefits. Future research can easily use digital measures; it reduces handling time per snake, reduces animal stress, and has the huge added benefit of measurement control. Multiple researchers can use the same images; reducing interspecific research error and creating a long-lasting data option. Penning, D. A., Gann, E., Thomas, W., Carlson, T., Mittelhauser, J., Bilbrey, L., and Cairns. S. (2013). An evaluation of techniques for measurements of snake length. Journal of Kansas Herpetology (Collinsorum) 2(1/2): 20-24. This species is the largest tortoise in Asia and is generally regarded as the 4th largest tortoise alive today. What makes this tortoise stand out from the others is their behavior, ecology, and morphology. The carapace has a very thick scute structure and a small, thin bone lattice underneath. A "typical" tortoise shell is the opposite; the bones are bulky and and the scutes are thin. When egg laying, females construct a leaf litter nest above ground, much like the American alligator. Other tortoises dig holes; the Burmese mountain tortoise mounds leaf litter around her eggs. Amazingly, after laying her eggs, she will sit atop her egg nest and guard it until the eggs hatch! In 2013, REPTILES USA magazine asked me to write an article on how to successfully keep and maintain these amazing tortoises. Penning, D. A. (2012). Burmese Mountain Tortoises. 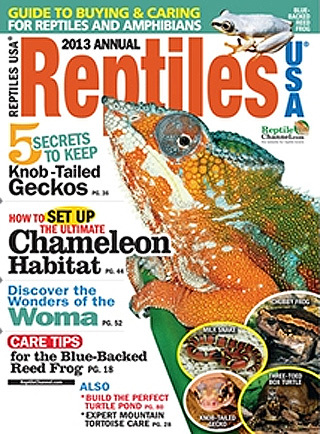 REPTILES USA: 2013:28–35. Early life histories have huge consequences for an animals's future. To grow rapidly, an animal can either eat larger meals or eat more often. Unfortunately, little work has investigated the growth consequences of these different strategies. Using two groups of corn snakes (Pantherophis guttatus), I measured their growth rates through time when fed either small or large prey. After 21 weeks of feeding, snakes that were fed larger prey were notably larger than those feeding on small prey. However, when I plotted their weekly body mass against the mass of consumed prey, their growth trajectories were similar. 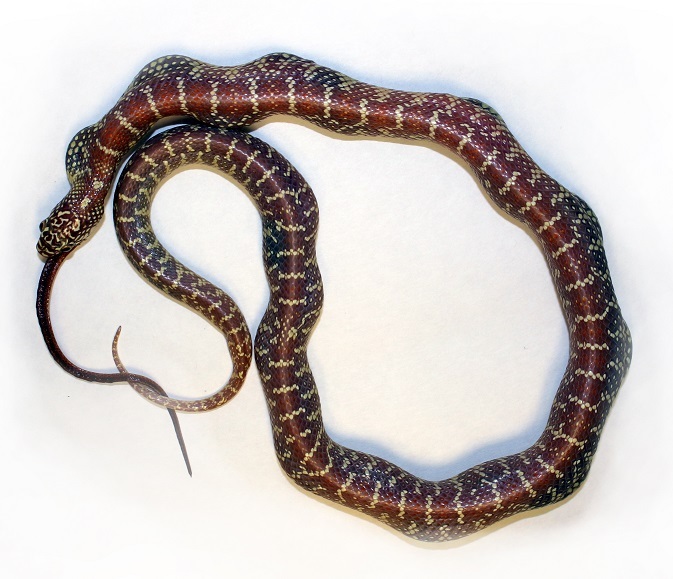 For corn snakes, either foraging strategy would yield similar growth per gram of prey. In theory, taking larger prey would result in earlier reproduction. Penning, D. A., and Cairns, S. (2012). Growth rates of neonate red cornsnakes, Pantherophis guttatus (Colubridae), when fed in mutually exclusive mass-ratio feeding categories. Herpetological Review 43(4): 605-607. 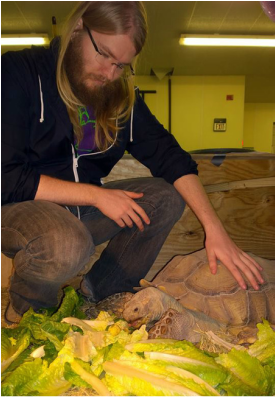 For several years I was able to gain experience keeping and breeding several tortoise species. I was able to partially fund my education by breeding reptiles. As my education advanced I stopped. I bred many species of tortoise but had some experience with the elongated tortoise (Indotestudo elongata); a much more specialized tortoise for a small group of keepers. The elongated tortoise is native to Southeast Asia and like many animals, is an endangered species. It is facing heavy declines due to illegal harvesting, largely for traditional medicine and food. Unfortunately, these tortoises are still being taken illegally for the pet trade as well. In 2009, REPTILES magazine asked me to write an article on how to keep and breed the Elongated tortoise. Penning, D.A. (2009). Go Long: How to Breed the Elongated Tortoise. REPTILES Magazine. July: 20–23.